BUYING PET PRODUCTS? – PRICE MATTERS! : “PETFLATION” UPDATE AND MORE! Since the great recession, price has become perhaps THE critical factor in the buying behavior of U.S. Consumers. 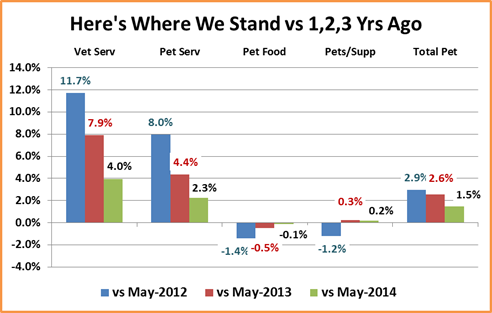 In our recent reviews of Consumer Pet Spending we saw that inflation and deflation can affect retail spending. However, there is not a universal rule. Price changes, up or down can have a different impact on the different Pet Industry Segments. Deflation can spur spending in a “discretionary” segment but retard it in a “need” segment. Moderate inflation is normal and expected by consumers. However, when it gets out of hand, it can negatively affect sales. 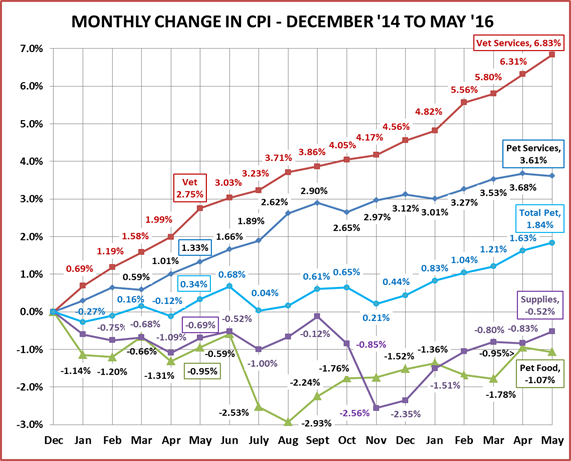 In this report we’ll update the changes in the CPI (from the USBLS) since December, both for total Pet and the individual segments. However, before we get to that, let’s do some “pricing” groundwork. We’ll take a look at some relevant facts from a study on The Shopping Habits of American Women done by Blackhawk Engagement Solutions and presented in a webinar by Retailing Today. 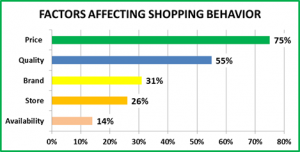 First, what matters most in the shopping decision? Obviously, price matters most in today’s world. However when you consider Price + Quality = Value, then Value is also twice as important as brand – a big change from pre-recession days. If Price is so important, then how does the shopper compare prices? With 71% of shoppers owning and using a smartphone daily, it’s not surprising that retail websites and other online sources, like Amazon and Google are usually the first choices. However, preference does vary by product category. Here’s how consumers price shop for pet products. You may be surprised by what is #1. For Pet Products, the # 1 place for checking prices is…in the retail store. The study covered a variety of product categories including clothing, furniture, sporting goods, toys and more. 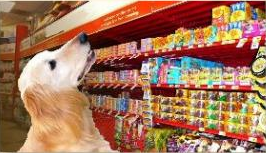 Only 2 categories had retail stores as the consumer’s first choice – Pet Products and Grocery. Grocery is certainly not surprising, with fresh food being such an important share of the category’s business. The preference for “in store” price checking doesn’t say that you don’t need an effective web presence (with a store pickup option) or that shoppers don’t use their smartphones to price check pet products when they are standing in the retail aisles. Perhaps, it just “speaks to” the personal nature of our relationship with our companion animals. Retail price and “value” are more important than ever in the consumer products business and the Pet Industry is no exception. 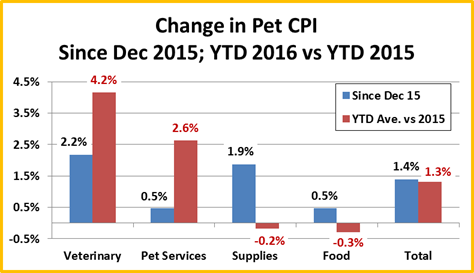 Let’s see what has happened with the Pet Consumer Price Indices since last December. 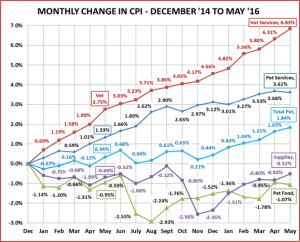 This chart shows the change from December 2015 to May 2016 and how the average for the first five months of 2016 compares to the same period last year. Veterinary – Prices in this segment are up over 4% vs the same period last year. This is exceptionally high but in fact, the inflation may still be accelerating. With a 2.2% increase just since December, it could reach 5% by yearend. One result of the prolonged high inflation rate is a reduction in the amount of Veterinary Services across a broad spectrum of demographic groups. There is a plus side…for the Supply segment, as there has been exceptional consumer demand for OTC treatments, meds and supplements. Pet Services – Although not as high as the Veterinary Segment, Pet Services pricing has been inflating over a prolonged period. So far there have been no major consequences in terms of consumer spending. The chart above shows that the inflation rate is starting to slow down, especially since December. Pet Supplies – Supply pricing is up 1.9% since December. This is a bit deceptive as the pricing is still recovering from the biggest drop in history last Oct-Nov. YTD prices are slightly below a year ago. Pet Food – Food prices have been gradually recovering from their record drop in Jul-Aug and are up slightly since December. However, they are below the same period in 2015. We’ll have to see which of these 2 opposing factors has the most impact on the consumer. Total Pet – Both increases are moderate, although somewhat higher than recent history. The 1.4% increase since December is unusual because it reflects increased prices in every segment. The 1.3% increase versus a year ago is more in tune with recent activity because it comes from decreases in both Food & Supplies which were overcome by increases in the Services…especially Veterinary. To understand and appreciate what is happening, you need to see it. Take a look at the monthly flow. Veterinary shows an unbroken string of increases and is even accelerating. The increase in the Service segment has clearly moderated beginning in September of last year. The product segments are on rollercoaster(s). Look at those record drops in the second half of 2015…but both Food & Supplies seem to be slowly recovering. 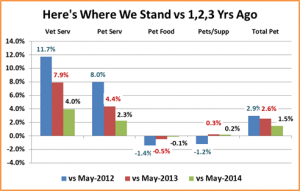 Pet Services: Increasing about 2.3% per year but moderating. Pricing in the Summer and Fall of 2015 was very volatile with record CPI drops in Products. We’ll see what 2016 brings.